Volunteer Lifeguards at Exmouth are warning people of the dangers from disposable barbeques being used on the beach after a four year old girl received serious burns from the hot sand during a family visit to the beach on Sunday. The Polish family from Heathfield near Newton Abbot were on a day trip to Exmouth when the incident occurred. 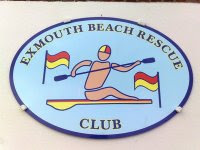 Volunteer Lifeguards from Exmouth Beach Rescue Club treated the girl before sending her to the Exmouth Minor Injuries Unit for further treatment. Club spokesman Nigel Snowshall said “We were alerted to the incident by a member of the public who witnessed the incident. A family member removed the disposable barbeque from the sand in order to dispose of it. Unfortunately the little girl walked across the area where the barbeque had been and fell onto one hand receiving serious burns to her left foot and hand”. “People do not realise how hot the sand gets underneath these barbeques and how long it stays hot for. We regularly deal with these incidents despite our efforts to advise people of the risks. We have worked with local Firefighters and East Devon District Council in an effort to promote the safe use and disposal of these types of barbeques popular with beach goers. We have managed to reduce incidents of bin fires along the beach caused by careless disposal but are still experiencing many burns caused by the hot sand”. “We definitely don’t want to spoil peoples’ fun but would urge them to take note of the following safety advice”. Have the barbeque away from any combustible materials. Never leave the barbeque unattended and supervise children closely when cooking. When finished, allow the barbeque to cool before handling it. Use water to ensure the barbeque is completely extinguished but do so carefully to avoid steam burns. Use water to cool the sand underneath the site and rake the sand around with a bucket or spade to allow the heat to dissipate. Finally do not put the barbeque in the bin, leave it next to the bin for disposal. This will prevent any risk of a bin fire. Mr Snowshall said “The club will step up its campaign on barbeque safety. These are serious burns that people are receiving. Burns like this can remain very painful for weeks with the risk of infection and other complications. Burns on the feet are particularly difficult to treat and keep clean and can render a person unable to walk for some time”.